Q: Who can take classes at The Movement Factory? A: All group classes are for adults 16+ over, except for Private training. Q: Where is The Movement Factory located? A: Our Lakewood location is located inside the Historic Lake Erie Screw Building, across from Madison Park. Our Rocky River location is on Lake Road, minutes from the communities of Westlake and other Cleveland suburbs. Lakewood: Our main studio at 13000 Athens Avenue #203, Lakewood, OH 44107 is inside a working factory, on the 2nd floor. To access the 2nd floor studio, please enter the main glass doors on Athens, go up the stairs to the 2nd floor, and turn left. On weekends and evenings enter through the entrance of the side parking lot that says "loading dock," go to the 2nd floor, turn left out of the stairwell, left again walking toward The Wrestling Factory, through the red door, and then around the corner to the left - you will find us there. View our video for directions from Madison Park here or the Screw Factory lot here! Rocky River: Our Pilates studio at 20161 Lake Avenue Rocky River OH 44116 is on the first floor of a small shopping area located under the Masonic Lodge. A: Lakewood: park in the side parking lot next to the building. Parking in the Madison Park lot across the street is also available when the West Driveway lot is full or the gate is not open. Rocky River: For the Pilates studio you can park in front of the building (30 minute spots only), across the street on Lake, and on the side streets by the studio. A: We ask all clients wear clean and comfortable fitness, yoga, or dance attire to classes. For dance classes, please wear appropriate footwear such as ballet shoes (ballet) or clean sneakers (hip hop). Please note that our Pilates studio in Rocky River has a mandatory sock policy - we require sticky/grippy Pilates socks for all clients which are available for purchase. We do not have a sock policy in studio #203. Q: How do I cancel a class that I booked? A: All cancellations prior to the 12 hour window before class must be made online through your account. Once you cancel, a class will be put back on the existing class card it was taken from or a class credit will be issued. If you need to cancel a class within the 12 hour window, no cancellations are accepted. The class is listed as "no show" on your account. Any cancellation or no show within the 12 hour window will automatically generate a charge of the cost of the class. If there is an emergency or an illness that occurs, you are eligible to get the class back onto your account by emailing the studio at info@themovementfactory.com and asking the class to be credited. Q: How do I cancel a private session that I booked? If you need to cancel a private session within the 12 hour window, please text or call your instructor directly, though understand that our policy is a 12 hour cancellation which means no cancellations are accepted and it will automatically generate a charge of the cost of the session. If there is an emergency or an illness that unexpectedly occurs, you are eligible to get the class back onto your account at your trainer's discretion by contacting your trainer directly. Q: Why did my class get cancelled? 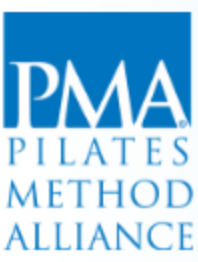 A: As of November 8 2018 all Pilates classes only will require an advanced RSVP with a 2 person minimum needed 12 hours before a class for the class to run. If a Pilates class does not have 2 people signed up 12 hours before the start time, it will be removed from the schedule. All other classes will not have a RSVP minimum and will run if there is 1 person in attendance (drop in or prior RSVP). If you have signed up and the class does not meet the minimum in attendance, you will receive an email 12 hours before when the class is cancelled with a class credit and promo code for a future purchase. You will have 60 days to use this class. It will be found under CLASS CARDS in your account and listed as credit for a cancelled class. To use the credit, you must be logged on, and then when you pay select USE CLASS CARD to apply the credit to your purchase. If the class is scheduled to run, and you are for some reason the only one who shows up for class, you will get a private session. Please sign up in advance, and for Pilates clients, please check your email and our home page schedule wihtin 12 hours before your class so you know if your class is running. A: Please sign up and pay through your online account. To take a class, you must have an online account. You are welcome to pay cash or check in person at the studio (online account still needed). Q: I just purchased one class. I wanted to purchase two, but it didn't give me the option to purchase more than one at a time or add another person to my order. What do I do? A: Each client must have their own online account. Please have everyone make their own account and pay online. However, as long as they have created an account and it's a drop in class, you are welcome to pay cash or check in person at the studio (online account still needed) for your friend! Q: What do I do if I'm late for a class? A: If you are less than 10 minutes late please quietly join the class. If you are more than 10 minutes late we ask that you do not attend for your safety and to not disrupt the class for other clients. Q: Can I rent the studio? A: Our Lakewood studio is available for rehearsal rental by professional dance companies and choreographers at an hourly rate. Please contact the studio via our contact form for more information. Based on availability. Q: What if I am going on vacation or have an injury and need to "hold" or extend my card? A: EFFECTIVE JANUARY 1st 2015: 1 extension allowed on each time sensitive purchase - 7 day minimum, 14 day maximum. Additional extensions $25. No exceptions. 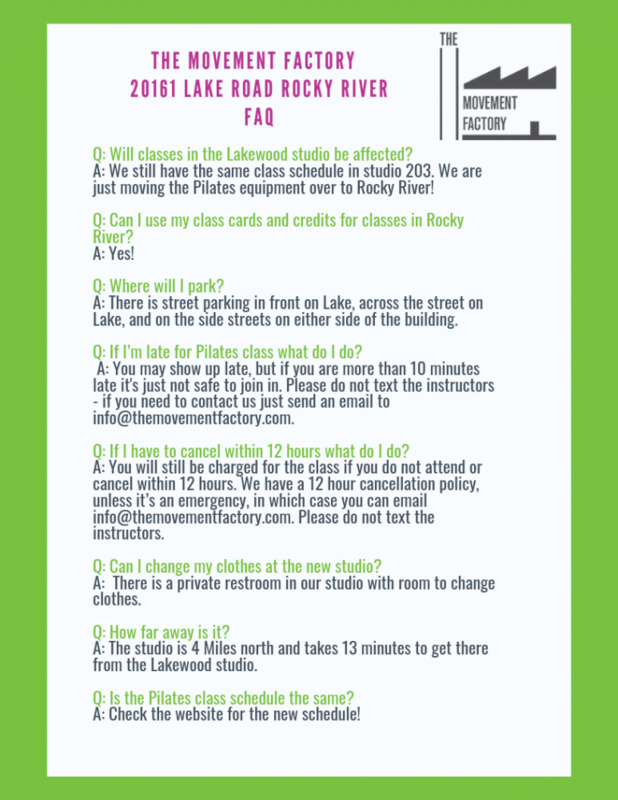 Please email info@themovementfactory.com to request an extension on your class card. Q: I would like to hold my bachelorette party at The Movement Factory. Is this possible? Q: My business would like to have a class from an instructor from The Movement Factory. Is this possible? A: You may pay online via Visa, MasterCard, AMEX and Discover. In person at the studio we accept cash and check payments as well as those listed above. Q: Can I have a family member use my package or class card? A: No. Packages and class cards are non transferrable between clients. Q: Why does my class card expire? A: Customary to all studios, discounted class cards have an expiration date. Please be sure to check the expiration date before purchasing so you are aware of the time frame you have to use your card. As of October 1, 2018, class cards have been extended to use within 6 monhts. Q: When does my Intro Package expire? A: The unlimited intro package is valid for 7 days from date of purchase. A: Purchases at The Movement Factory are non-refundable. We do offer class credits or credits to client accounts as requested. Q: When do my purchases expire? A: Class cards and private session cards expire 180 days from date of purchase as of October 1, 2018. Special sales have different time sensitive dates ranging from 1-6 months as advertised. All expired Groupon or Amazon Local deals will be converted to the purchase value - please refer to their websites for more information on policies and contracts and your specific expiration date. Q: Do you offer student discounts or other discounts? A: As of February 9th 2017 we no longer offer student discounts.